Trading with leveraged financial instruments can be very rewarding but it can also be very risky. Trading without appreciating the risks means you could sustain a loss of some or all of your invested capital and therefore we strongly encourage our traders to familiarize themselves with the aspects of risk management. Below you can find useful resources we suggest you download and read carefully. Let’s face it – trading involves risk, since it is all about finding investment opportunities and managing your risk exposure according to your personal preferences. Trading financial markets has come a long way since it was formalised in the mid-15th century and access to various financial instruments has never been easier. Nowadays, traders can choose from dozens of different financial products to find exactly which one suits your personal risk-reward preference best. 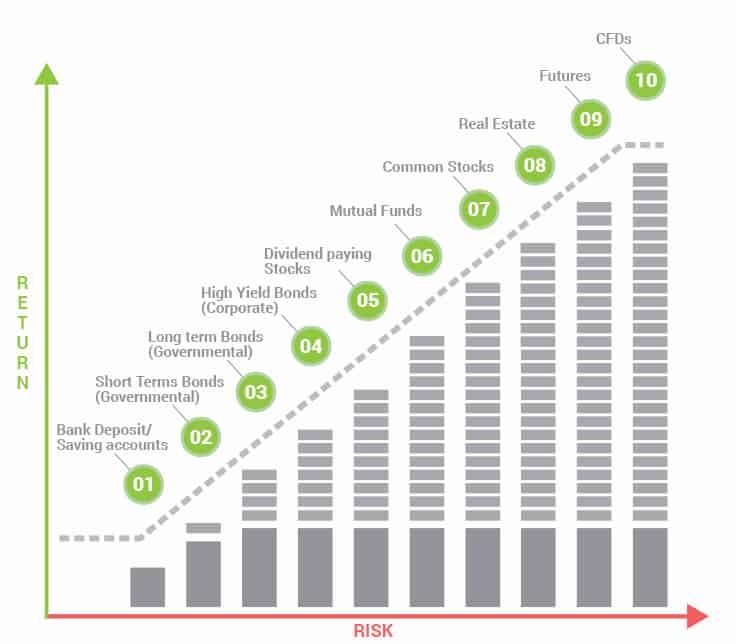 Usually, and in order to visualise the risk-return relationships the various financial products have under normal market circumstances, the so-called risk-return matrix is used. On the bottom left-hand corner, you will find investment products typically yielding a low return with low risk, proceeding to the top right-hand corner the risks but also returns rise. In other words: sleeping well at night knowing your money is parked in an AAA-rated bank’s cash account will not generate any substantial return (actually, with the economic development the industrialised world has gone through over the past few years, where interest rates were below real inflation rates, your money is worth less each month). On the other hand, those who dare to take risks with certain parts of their savings and succeed will be rewarded with exponentially higher rates of return. This means that trading requires a lot of discipline. We are here to assist you as best as we can and have developed several tools available only on our platform to help you find the right risk-return preference. The deal between you and us is straight forward: by providing you with a clean and transparent access to CFDs on the most interesting assets in a regulated environment we give you the tools to potentially generate very high returns – you just need to learn to become a disciplined trader managing your investment risks.